We warned you this was for maintenance geeks only. Bellingham Golfers on Twitter would have been confused this morning by a photograph (right) Sudden Valley superintendent Jacob Close posted showing his experimentation with a new coated rye-grass seed. 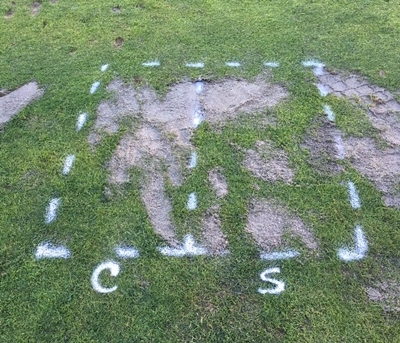 The picture, taken on the driving range, showed a painted square of turf with a dotted line down the middle, the left side showing divots filled with the new coated seed, the divots on the right with the standard three-way rye Close typically uses to fill divots on the course. You have to be some sort of turf nerd to be interested in this stuff admittedly, but for those that are curious about course maintenance the photo and caption - "Always testing: coated seed vs standard 3-way rye" - raised three questions: 1) What is coated seed? 2) What is a standard three-way rye, and 3) What is Close expecting/hoping to happen here? In order...coated seed, says Close, is literally grass seed that is coated in a polymer or waxy substance that helps the seed hold water longer and germinate quicker. "The coating literally enables the seed to pull in water and retain it," says Close. "I suppose it works in a similar way to a baby's diaper. Quicker germination means divots can heal sooner." Three-way rye is basically a blend of three rye seeds that superintendents use as their standard divot fill. "Grass grows differently in different parts of the course," says Close. "One seed does better on this fairway than it does on that one, so by mixing the three rye seeds you can be fairly sure at least one of them is going to do well in a certain location." Lastly, Close obviously hopes the new seed product will do what the salesman tells him it can - that it germinates quicker than his exisiting seed and produces strong, healthy turf sooner. "Currently, the rye mix I use germinates in about six days," says Close. "I'm hoping this new seed will do so in three." 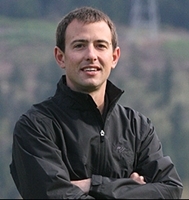 Close has built a solid reputation for producing excellent playing surfaces in his five and a half years at Sudden Valley, and the quality of the range is as important to him as the course itself (well, almost). "I love hitting balls on the range," he says. "So it's important to me that the range is in good condition. When I first arrived here, the range didn't look terribly good. I want it to look beautiful." Jacob Close - working hard to ensure members and visitors at Sudden Valley practice and play on the best surfaces possible.